How’re things in your world? Here in northern Germany… Summer is kind of here! Well with mostly showers, but at least it’s a bit warmer. In Hamburg I’ve been to Elbstrand (beach at the Elbe River), different parks (Haynspark and Planten un Blomen), the Alster River and took a first-time trip in the Elbe River. Moreover I’ve been to Sankt Peter Ording (North Sea, Schleswig-Holstein), Ratzeburg (town in Schleswig-Holstein), Boberger Duenen (dunes near Hamburg), Leipzig (eastern Germany, state of Saxony), Ruegen (German island, Baltic Sea), Schwerin (state of Mecklenburg-Vorpommern) and Luebeck (city in Schleswig-Holstein). It’s no lie that in northern Germany it has been pouring a lot lately, but what to do..? Some cities had floods as well! Of course staying indoors is not an option for me. So when it was sunny outside I took full advantage of sunbathing and enjoying Hamburg… even got sunburned! On the not-so-sunny days I met up with my friends and even got to visit the Hamburg Dungeon. Sankt Peter Ording (close to the North Sea) is about 1,5 hours from Hamburg by car. I stayed here two nights for a company event and had a wonderful opportunity to try out Landsailing on its 12 km beach, which was really cool! It’s also a peaceful place to gaze at the sunset! Landsailing at Sankt Peter Ording. Sunset at Sankt Peter Ording. The town of Ratzeburg (island on the lake) is about an hour drive from Hamburg, but its well-worth the journey! It’s surrounded by two lakes, the Kuechensee and the Ratzeburger See being the biggest one. 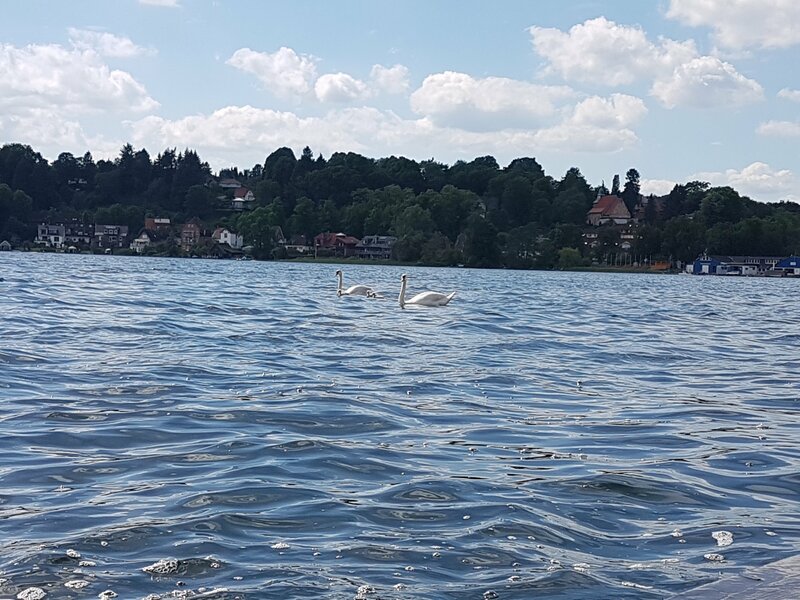 Here you can take a small ferry and explore the Ratzeburger See or rent rowing boats. Highly recommend Eis Pavillon Pelz (ice cream shop), which have been serving home-made ice cream and cakes for over 60 years! This protected area was quite astonishing, because these sand dunes are remnants of the ice age. It’s located just about 20 minutes outside of Hamburg. Perfect place to relax on a sunny day in a natural sandy setting. Stretching it out at the Boberger Duenen. Napoleon Bonaporte (1769-1821): he was defeated in Leipzig during the Battle of the Nations in 1813. There’s a monument (Völkerschlachtdenkmal or Monument to the Battle of the Nations, tallest monument in Europe!) commemorating his defeat, where coalitions were formed by Prussia, Sweden, Russia and even the Dutch to fight against Napoleon’s army. My favourite part of the monument is the Hall of Fame, where 4 tall figures (almost 10 meters!) depict the qualities of German people: fertility, faith, bravery and sacrifice. Johann Sebastian Bach (1685-1750): German Baroque composer, known to be the greatest composer of all time and an excellent organ player. It’s a shame he only got recognition after his death. He’s buried at the Thomaskirche, outside this church you will find his statue. Johann Wolfgang Goethe (1749-1832): German writer and statesman born in Frankfurt, but studied law at Leipzig University. The Auerbachs Keller (cellar wine bar) is known to be the place (now a restaurant) where Goethe was inspired to write his famous book Faust part one (a tragic play which is compulsory for many Germans to read). The Panaroma Tower: the tallest tower (142 meters) of Leipzig was our first stop, it has a shape of an open book. At the top we saw other impressive buildings such as the Red Bull Arena, Bayerischer Bahnhof (oldest railway station in Leipzig), the main train station and the old and new town hall. The Marketsquare: where you can find the Rathaus (townhall), shopping area and restaurants. The St. Nicolaikirche (Saint Nicholas church): one of the biggest churches in Leipzig of which construction started around 1165, just centuries later the architectural style has changed from Romanesque, Gothic, Baroque and Neoclassical. The interior of the church is quite exquisite because of the palm pillars. Moreover, Bach also did some of his works on the church’s organ. This church was notably known for being the starting point of the peaceful revolution in 1989, where demonstrators would gather with candle lights. Ultimately the peaceful protesters outnumbered the army, leading to more protests throughout East Germany and finally the fall of the Communist Regime (9th November 1989). The Wildpark: in this park we headed first to a boat rental and rented a rowing boat, we rowed for an hour in the river Pleisse and met cheerful fellows singing along the way. Afterwards we walked to the animal park (free of charge) where we fed wild deer, saw different types of birds, bissons and boars in their natural habitat (animal feed was sold in fending machines). The Panometer (also known as Gasometer): it’s a venue for art in Leipzig. Here I got to check the exhibition of Titanic by Yadegar Asisi (well-known for his panoramas), where he gives visitors a close-up of the sunken Titanic (3800 meters below water). It’s actually a 360-degree illustration of Titanic of 1:1 scale. He really gives a taste of his personal research and throughout the exhibition you’ll note all the details. At the Panorama Tower and the University of Leipzig. A view from the Panaroma Tower. On a square next to the St. Nicholas Church. Trying to feed a deer at the Wildpark. Titanic exhibition by Yadegar Asisi. All in all, Leipzig should totally be on your list of places to visit in Germany because of so many historical and cultural facts. The funny part was.. I rented an artsy place at AirBnb and stayed at the notorious street of Leipzig, which was the Eisenbahnstrasse… yet I didn’t notice anything peculiar! Ruegen is a German island in the Baltic Sea, just 4,5 hours by train from Hamburg. So when my parents came to visit me, I’ve decided to bring them to a typical German holiday location. I’ve bought a promotional Mecklenburg-Vorpommern ticket for our one-way journey, which was only Eur 33 for the three of us. We stayed at Binz (eastern coast of Ruegen), known to be a famous seaside resort with beautiful villas and spa houses (very much on the pricey side). It was nice to spend a couple of days with my parents, relaxing on the white sandy beaches and even biking with my dad near the seaside. Yet the Baltic Sea was too cold for us! A view of the beach and resorts at Binz. After my visit to Ruegen with my parents, we stopped in Schwerin to visit the Schwerin Palace (built 1845-1857), the architectural style is Romantic Historcism. The Palace is also being used by the State Parliament of Mecklenburg-Vorpommern, owned by state since 1919 after the abdication of Grand Duke Friedrich Franz IV as a result of the German Revolution. Inside the palace there’re different thematic rooms (e.g. Library, Drawing Room, Flower Room and the Throne Room, exhibitions (such as the silver collection, porcelain and artillery) and outside you can walk in its beautiful garden/park filled with Baroque sculptures along Lake Schwerin. In front of Schwerin Palace. In the garden of the Schwerin Palace. This is the second time I’m visiting Luebeck (see the first time), it’s a charming old town with over a thousand years of history. 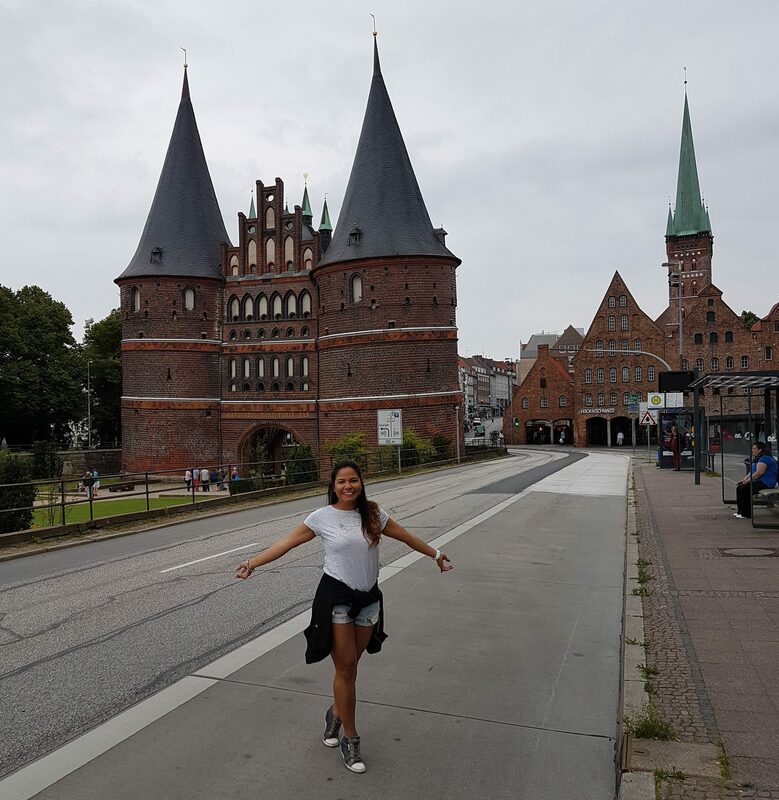 Therefore I had to bring my parents here to show them Holstentor and tour around the city because this city is also known as one of the major ports of northern Germany. 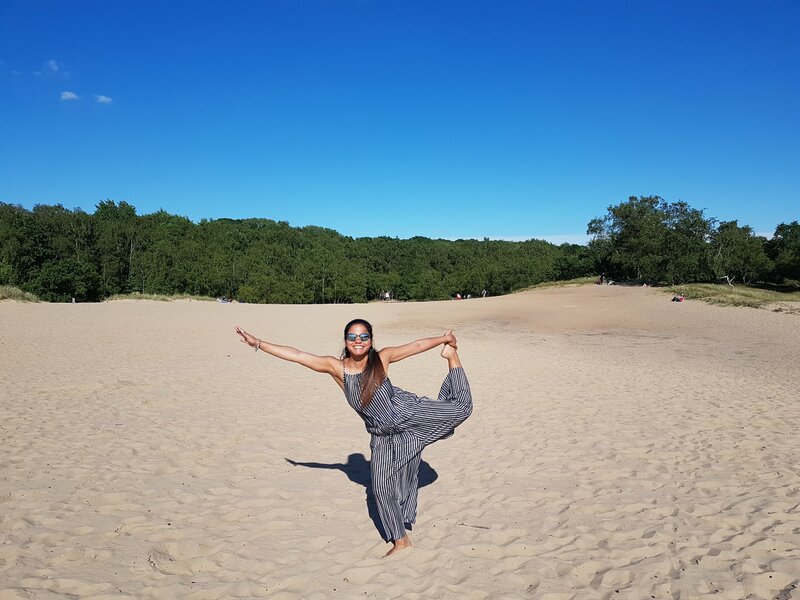 My first summertime in Germany was very eventful even though there were a lot of rainy days, I definitely made the sunnier days memorable. Some escapades were also rewarding as I got to learn about other German cities. I especially enjoyed bonding again with my family after a long time. My favourite city of my previous travels was Leipzig, because there were a handful of cultural activities and landmarks to visit. I definitely recommend this city! That’s it for now!! I know many of you have waited so long for a post, so I truly hope you enjoyed reading this one. Have a nice remainder of summer!